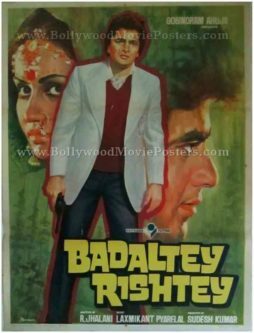 Old Bollywood poster for sale of the classic Hindi film Badalte Rishtey (1978). This is an actual surviving vintage Bollywood poster of the 1978 Hindi film that starred Rishi Kapoor, Jeetendra and Reena Roy in prominent roles. 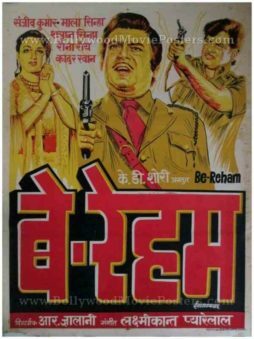 Printed and circulated during the original first release of the film (somewhere in the late 1970s), this old Bollywood poster for sale was designed for publicity of the film but never ended up being used. This vintage Bollywood poster was originally hand painted on canvas by one of the greatest and highest paid Bollywood poster painters of all time, Diwakar Karkare of Studio Diwakar fame. The printed signature of master Bollywood poster artist Diwakar is seen on the bottom left of this vintage Indian film poster. Diwakar’s mastery over the paint brush is clearly visible in this old Bollywood poster. Stunning hand painted side profiles of actors Jeetendra and Reena Roy are seen flanking a large figure of Rishi Kapoor holding a pistol. Rough brush strokes are visible in the background of this vintage Indian film poster.